The Empty Hearts, Carla Olson, Carla Olson & Mick Taylor. Ian Patrick McLagan /ˈiːən məkˈlæɡən/; (12 May 1945 – 3 December 2014) was an English keyboard instrumentalist, best known as a member of the English rock bands Small Faces and Faces. He also collaborated with the Rolling Stones and led his own band from the late 1970s. McLagan first started playing in bands in the early 1960s, initially using the Hohner Cembalet before switching to the Hammond Organ and Wurlitzer electric piano, as well as occasional guitar. He was influenced by Cyril Davies' All Stars, and his first professional group was the Muleskinners, followed by the Boz People with future King Crimson and Bad Company member Boz Burrell. In 1965, he was hired, for the sum of £30 a week, to join Small Faces by their manager, Don Arden, replacing Jimmy Winston. Once the 'probation' period ended, his pay was reduced (at his request) to £20 a week, which was what the other band members were getting. They never received more than that because Don Arden collected all the proceeds of their hard-earned work, and it wasn't until 1997 that they started receiving any royalties. 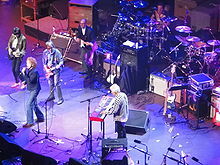 McLagan played his debut gig with them at London's Lyceum Theatre on 2 November that year. In 1969, after Steve Marriott left the group and Rod Stewart and Ronnie Wood joined, the band changed its name to Faces. McLagan played piano on the studio side of the 1972 album The London Chuck Berry Sessions. After the Faces split up in 1975, McLagan worked as a sideman for the Rolling Stones, both in the studio (Some Girls including electric piano on "Miss You"), on tour and on various Ronnie Wood projects, including the New Barbarians. In addition, his session work has backed such artists as Chuck Berry, Jackson Browne, Joe Cocker, Bob Dylan, Melissa Etheridge, Bonnie Raitt, Paul Westerberg, Izzy Stradlin, John Hiatt, Frank Black, Nikki Sudden, John Mayer, Bruce Springsteen, Tony Scalzo, Carla Olson and Mick Taylor. McLagan was a member of Billy Bragg's band "The Blokes" for several years in the late 1990s and early 2000s, co-writing and performing on the 2002 England, Half English album and tour. In 2009 McLagan joined the James McMurtry band on tour in Europe. On 25 September 2010, at Stubbs in Austin, Texas, McLagan joined The Black Crowes on keyboards and vocals for their encore set. The set included two Faces songs, "You're So Rude" and "Glad and Sorry". Also in 2013, he appeared with the Warren Haynes band at the Moody Theater in Austin, Texas, playing piano on one number and organ on the other. In 2014, McLagan was a founding member of the Empty Hearts. The group recorded on 429 Records and McLagan's bandmates included Blondie drummer Clem Burke, the Chesterfield Kings' bassist Andy Babiuk, the Cars' guitarist Elliot Easton, and the Romantics' guitarist and vocalist Wally Palmar. The band's self-titled first album was released 5 August 2014 and produced by Ed Stasium. McLagan is featured prominently on the Lucinda Williams double album Down Where the Spirit Meets the Bone, which was released 30 September 2014 on her own label, Highway 20 Records. McLagan also released several solo albums. An in-demand player, he filled the role of bandleader with his own Bump Band from 1977 onwards. Towards the end of his life, he relocated to Austin, Texas and did gig nights at local clubs and bars. Ian McLagan & the Bump Band played at the 2006 Austin City Limits Music Festival, and opened for the Rolling Stones in Austin, Texas, in 2006. McLagan was married from 1968 to 1972 to Sandy Serjeant, a dancer on the television show Ready Steady Go!, with whom he had a son, Lee. McLagan then developed a relationship with Kim Kerrigan, the estranged wife of Keith Moon, drummer of the Who. She divorced Moon and she and her daughter Amanda (from her marriage to Moon) commenced living with McLagan. McLagan and Kerrigan were married in 1978, one month after Moon died, at the age of 32. Kerrigan died in a traffic accident near their home in Austin, Texas, on 2 August 2006. She was 57. McLagan published an autobiography, All the Rage: A Riotous Romp Through Rock & Roll History, in 2000, and added to, appended and reprinted it in 2013. ^ Myers, Paul (2007). It Ain't Easy: Long John Baldry and the Birth of the British Blues. Greystone Books. p. 64. ISBN 9781553652007. ^ McLagan, Ian (2000). All the Rage: A Riotous Romp Through Rock and Roll History. Crown Publishing Group. ISBN 9780823078424. ^ Tobler, John (1992). NME Rock 'N' Roll Years (1st ed.). London: Reed International Books Ltd. p. 152. CN 5585. ^ "Interview: Ian McLagan (Bump Band, Small Faces, Faces, Rolling Stones)". Hit-channel.com. 2014-06-20. Retrieved 2016-02-21. ^ Kristi Coulter. "England, Half English - Billy Bragg,Billy Bragg & the Blokes - Songs, Reviews, Credits, Awards - AllMusic". AllMusic. Retrieved 5 December 2014. ^ "The Official Page of James McMurtry". James McMurtry. Retrieved 24 December 2016. ^ "Empty Hearts: New Supergroup With Blondie, Cars Members (Exclusive Song Premiere) - Billboard". Billboard. Retrieved 5 December 2014. ^ Tom Finkel (4 September 2014). "Lucinda Williams Premiere: 'East Side of Town' From Down Where the Spirit Meets the Bone". Sound of the City. Retrieved 5 December 2014. ^ Uncredited, Ian McLagan - obituary. The Telegraph, 17 December 2014. Retrieved 21 December 2014. ^ Uncredited, Ian McLagan obituary. The Guardian, 12 December 2014. Retrieved 21 December 2014. ^ "Iconic model who married Keith Moon dies in crash". The Independent. Retrieved 5 December 2014.